Although the Second World War was at an end, the Football League divided its competition into regional sections for the 1945-46 season because of the exceptional conditions at that time, with so many players still serving in the Armed Forces or employed on essential war work. Argyle played in the Football League South that season, against first-class opposition such as Arsenal, Chelsea, Spurs, Aston Villa and Wolves. It proved impossible for the Pilgrims to field a regular side; 72 players made an appearance and performances inevitably suffered. From week to week the club called on Armed Services players, guest footballers from other League clubs and local amateurs to supplement its registered playing staff. Brown was one of 21 players whose only first team games for Argyle were in the Football League South season and who usually played in local football or for the Armed Forces. Born in Ballymoney in Northern Ireland, he played for Linfield prior to joining the Royal Navy, and his brothers Gerry and Cecil were pre-war Wolverhampton Wanderers players. The centre-forward wasted no time in showing that extra touch of class and during a miserable season for Argyle he quickly became a terrace hero. After scoring a hat-trick on his debut in a remarkable 5-5 draw at Southampton on the opening day of the season, he went on to net 17 goals in 24 games, still one of the best goals to games ratio of any Argyle player, this during a season in which Argyle won only three matches out of their 42. 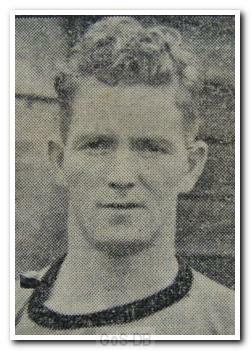 Paddy, as he was nicknamed, scored almost half of Argyle's goals despite playing little more than half the campaign, and not surprisingly he scored in all three of the games the club won that season. Brown's finest performance came in February 1946 when he scored a hat-trick in a 3-2 home win over Wolverhampton Wanderers – his brothers' old team – in miserable, cold and wet conditions that seemed to epitomise the season up to that point. Argyle's second win was their only away win of the season, at champions-elect Birmingham City. Prior to the match the editor of one national paper wrote "If Plymouth Argyle beat Birmingham City I will eat my hat". Brown duly scored and Argyle managed to hang on to win 3-2. As good as his word, the Monday edition of the paper had a picture of said editor with a knife and fork in his hand confronting a plate holding a straw hat. However, it wasn't to last. When the full Football League programme resumed the following season, the arrival of Bob Thomas, to link up with his brother Dave, kept Brown out of the team. Later that season he moved to Hull City where made his full Football League debut and scored three times in seven appearances, before then moving back to Linfield.